Another lie in, of sorts, after a great evening with the boys at the Folly Inn. We took our time over breakfast and I was torn over where to go today as the wind looked very gentle and the tides didn’t really want to help over to Chichester until much later in the day. Pottering around the central Solent didn’t seem like it would have any purpose although we did consider Hamble and Bucklers Hard. We decided to head over towards Chichester and see what progress we would make. The wind was dire and Harry held on a broad reach as we sailed slowly past Osborne Bay. Downwind sailing with about 1kt of apparent wind we were soon roasting so a quick change into shorts and tee shirts was in order. 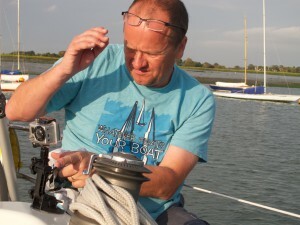 The navigation system was estimating about 3 hours to Horse Sand Fort and then another couple of hours from there to West Pole off Chichester Harbour entrance. That would have us arriving at low tide. With 0.7m at low tide on 1.3m bar we would definitely have to lift the keel in order to get in. I was a bit concerned about loss of stability but the sea state was slight concluded we would be okay. What the navigation system doesn’t factor is the change of tide and we actually arrived at West Pole at 4pm, 2 hours early. The ebb was stronger though and with 5.7kts boat speed we only made 2kts over the ground. Lots of traffic was coming in at this time and we heard someone on channel 16 alerting a Cornish Crabber they were sailing into danger. Soon after, a rib headed over to warn them and they turned to port and came back into the safe channel. Helen helmed us into Itchenor Reach and as we passed East Head we could see a number of boats drying on the sand. We earlier abandoned all thought of having a go ourselves. Our rationale was we were taking on a lot already with this yacht given our crew and a day without incident would be nice! 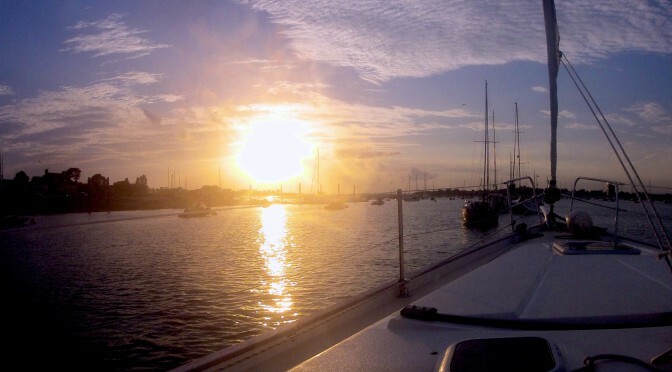 We were hoping for a visitors mooring but all were taken so our back up plan of Chichester marina was looking likely. Just as we had given up hope a yacht dropped from its mooring and confirmed they were leaving. We just don’t get lucky like that. Everyone was briefed on mooring procedure and we approached very slowly. 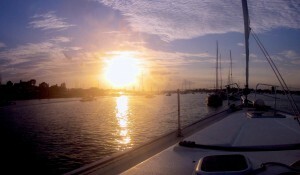 There was still enough tide to allow us the vital control we needed as we steered into it. Helen was unable to hook the pick up line as the heavy chain held its short rope straight down. Tom took over the helm and Harry, Helen & I we’re able to haul up the chain. Tom used the bow thrusters to fine tune our position but basically we were stationary under his control. After hooking on to the chain Helen lassoed another line around it as back up. We enjoyed a beer as we watched the rest of the river population retire. Time to set up the GoPro for a sunset sequence.